Posted at: 9/01/2010 10:46:00 AM . 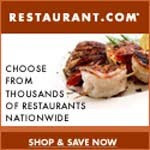 There is a new promotional code for restaurant.com. Use the code MENU before September 2, 2010. to save 60%.